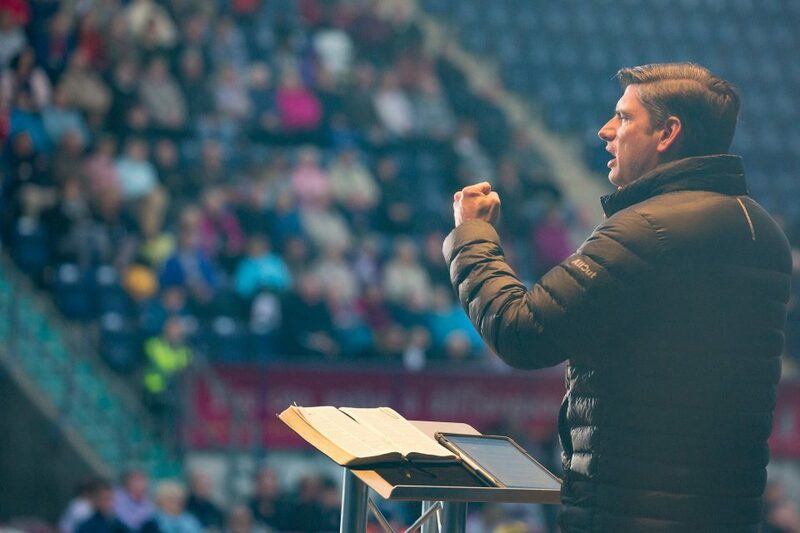 Over 2,000 people braved the cold temperatures to hear Will Graham share a message of hope in Falkirk, Scotland, Friday night. This man fell to his knees during worship led by Christian artist Aaron Shust. “It’s good to be back in my native land,” Will Graham told more than 2,200 people on a chilly summer night in the open-air Falkirk Stadium. 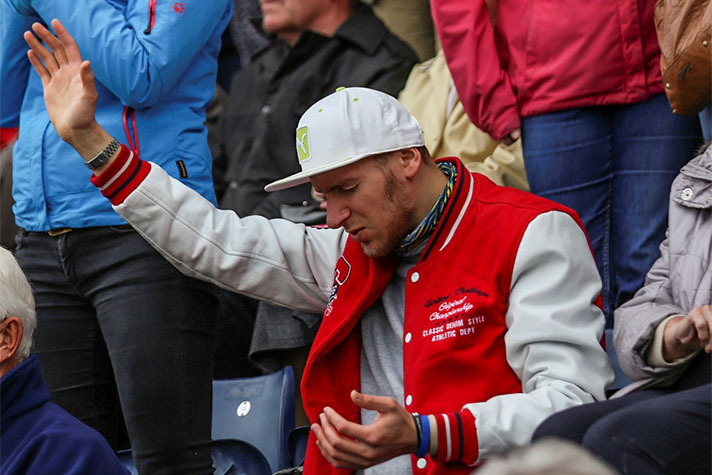 In 2016, Will shared the Gospel at the North East Scotland Celebration of Hope In Peterhead. Friday kicked off the three-night Central Scotland Celebration of Hope in an area famous for another William—Scottish hero William Wallace and his rebellion against England in 1298. Will Graham’s own ancestry is three-quarters Scottish, with forefathers from the Graham, Bell and Cunningham lines hailing from the Land of the Brave. In the stadium, many heard a different story of courage in Will’s message from the Prodigal Son in Luke 15—the courage to come home to God. “You’ve wondered why your life is a mess,” Will said. “You’ve left home. You don’t follow God’s rules. When Billy Graham held Crusade meetings in Scotland in 1955, about half of the Scottish people attended church regularly, compared to about 7 percent today. With a hearty laugh, she told how she had once met Billy Graham at a Washington, D.C., airport while travelling to America. Rosalynn wasn’t used to seeing such tight security. “I was nervous with all the heavily armed police around so I just started humming “Hail to the Chief,” “Bom, Bom, Bom, Bom,”—which sounded like the word “bomb,” she laughed. “Billy Graham heard me, smiled and said, ‘You’re not supposed to say that word in an airport.’” Realizing her mistake, Rosalynn shared a laugh with him, and said afterward they took time to pray for people’s safety and for peace in the world. On fire for God, Rosalynn came back to Him after hitting rock bottom. Left semi-paraplegic from falling down stairs, she eventually hit an all-time low, even thinking about taking her own life. After being prayed over at her son’s church, Rosalynn credits God for helping her regain feeling in her feet. And though she still uses a wheelchair, she is able to stand once again. “Nothing could stop me after that,” she said. “I took that experience and I try to help other people.” Rosalynn tells of God’s love and prays with people nearly everywhere she goes from supermarkets to hospitals—even on holiday. Barry Fowler knew God was there for him, even when he was drowning in alcohol. “I feel like God called me back tonight,” he said. Downing two bottles of brandy a day, Barry knew he had fallen far from Jesus. A week ago he fell to his knees, crying out to God. “Like the Prodigal Son, I got to my lowest point,” he explained. Barry recommitted his life to Christ, along with nearly 100 others. “It’s just such a lovely feeling to know that God’s holding you again,” he said. Because God knows what’s good for us, giving us rules to live by. “Imagine watching the World Cup with no rules,” said Will. “You could trip people, punch them. Rules give purpose to the game. “People want to live life with no rules,” he said, and “then they try and figure out why their life doesn’t make sense. Not just to the land of your heritage—like Will Graham—but to the eternal kingdom of God. A forever home where everyone is forgiven of their sins. Ready to come home to God? Start here.